Chicken Francaise has always been one of those foods that makes me feel special. Growing up, I would only have it at restaurants or weddings if I was lucky enough to have it as an option for dinner. Once I realized it was easy enough to make on my own, all bets were off. Its zesty lemony flavor is a perfect pair to the buttery white wine sauce. Served over pasta or rice, this chicken dish is sure to please friends and family. I chose to serve the chicken over farfalle (bow-tie pasta) because it really ups the fancy factor on this dish, but feel free to serve the chicken over any starch of your choice. 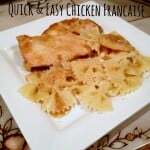 This recipe was adapted from Food Network’s Tyler Florence’s Chicken Francese. Its zesty lemony flavor is a perfect pair to the buttery white wine sauce. 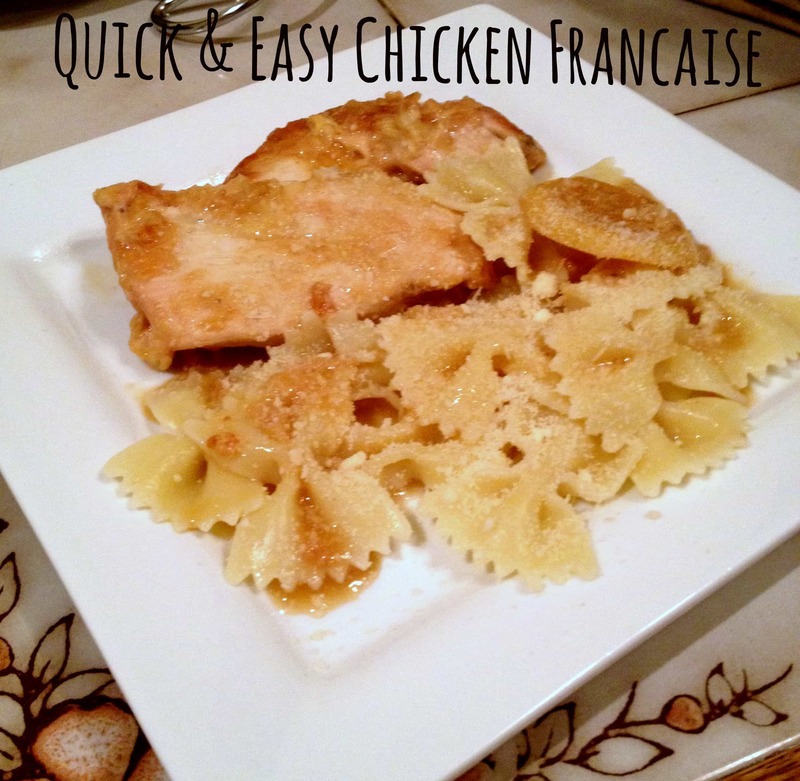 Served over pasta or rice, this chicken dish is sure to please friends and family. I chose to serve the chicken over farfalle (bow-tie pasta) because it really ups the fancy factor on this dish, but feel free to serve the chicken over any starch of your choice. Place chicken breasts side by side on a cutting board and lay a piece of plastic wrap over them. Pound the chicken breasts with a flat meat mallet, until they are about 1/4-inch thick. Pour flour into a shallow dish and season with a fair amount of salt and pepper; mix with a fork to distribute evenly. In a wide bowl, beat the eggs with 3 tablespoons of water to make an egg wash (many times I have only used only 2 eggs instead of the 4 originally called for.) Heat the oil over medium-high flame in a large skillet. Dredge both sides of the chicken cutlets in the seasoned flour, and then dip them in the egg wash to coat completely, letting the excess drip off. When the oil is hot, add the cutlets and fry for 2 minutes on each side until golden, turning once. Make sure the chicken is cook thoroughly by gently slicing into the largest cutlet. Once they are no longer pink on the inside, remove the chicken cutlets to a large platter in a single layer to keep warm. Toss the lemon slices into the pan and cook for 1 to 2 minutes, until fragrant. Add the wine, broth, and lemon juice, simmer for 5 minutes to reduce the sauce slightly. Roll the butter in some flour and add it to the skillet to thicken the sauce. Stir to incorporate and dissolve the flour. Reduce the heat to medium-low and return the chicken to the pan; place the lemon slices on top of the cutlets. Simmer gently for 2 minutes to heat the chicken through. Season with salt and pepper and garnish with chopped parsley before serving.